Today the woven zigzag chain stitch sampler was completed with these samples. Two detached chain stitches are worked at an angle on one side of the woven zigzag chain stitch in the first row. Round gold beads and copper bugle beads are added to the last two rows. I used variegated cone threads to work this sampler. I like the woven effect of this stitch. The way it stands out also makes it an attractive stitch. This week’s Woven zigzag chain stitch of the TAST 2013 challenge by SharonB is an extension of last week’s stitch. It sure takes time to work this stitch, but is well worth it. I just practiced this stitch in these few samples. 1.After working the basic woven zigzag chain stitch in the first row, the long and short version is alternated in the second row. The third row has wide and narrow version of this stitch and shallow curves are worked in the last row. 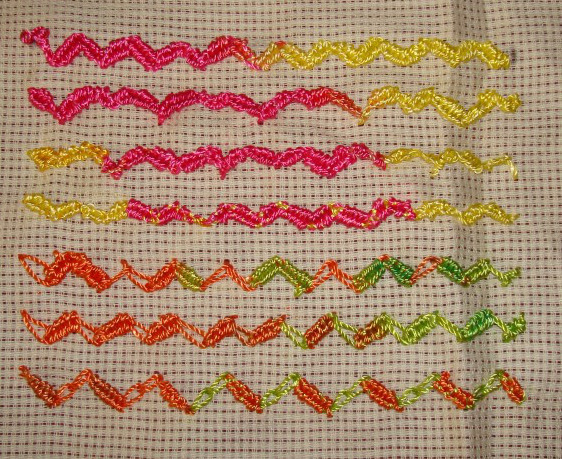 2.These samples are variations of this stitch with zigzag chain stitch. Two woven zigzag chain and two basic zigzag chain are alternated in the first row. The chain stitches are woven while going up and left as they are while coming down in the second row. 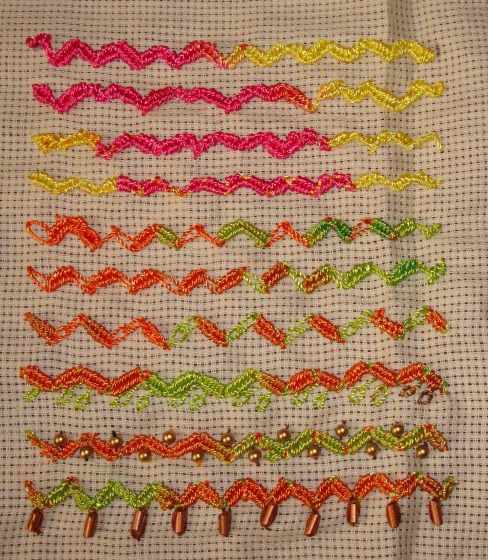 After weaving one long chain stitch two chain stitches are worked to form the zigzag pattern in the third row.